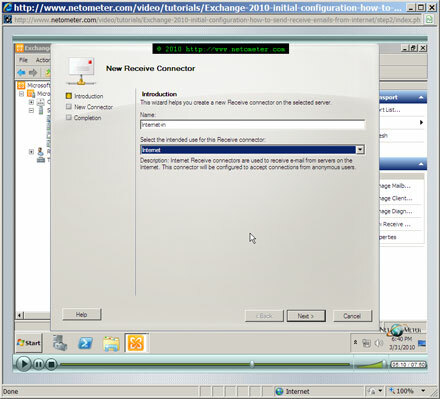 In the following Step-by-Step video tutorial, we will demonstrate Exchange 2010 initial configuration. We are using a single Exchange Server 2010 typical installation in a scenario without Exchange 2010 Edge Server. You will see the post installation steps that you have to go through to make your server functional. â— is unable to receive e-mails from the Internet â€“ anonymous SMTP connections are dropped, and thatâ€™s how most e-mail servers will send e-mails to your Exchange Server. â— does not configure any explicit Send Connectors, and is unable to send e-mails to the Internet. â— the default e-mail address policy and accepted domain are using the forest root FQDN (Fully Qualified Domain Name). In many cases, the external (e-mail) domain name which a company uses is different from the one used for Active Directory. It is also possible that you need to be able to accept e-mails for more than one e-mail domains. As we are not using Edge server in our scenario, we will create manually Internet Send and Internet Receive Connectors, and we will set them to use our Exchange 2010 Server public Fully Qualified Domain Name. Finally, we will We will show you an easy way to check and configure external postmaster address, using the GUI – Exchange Management Console. FollowingÂ the steps outlined bellow, you will have your Exchange Server 2010 up and ready to send and receive e-mails using the e-mail domain that you need. Stay tuned on NetoMeter – subscribe to NetoMeter RSS. NetoMeter is a awesome site to get knowledge like real scenario.